The Compulsive Reader: Interview with Wendy Wunder! 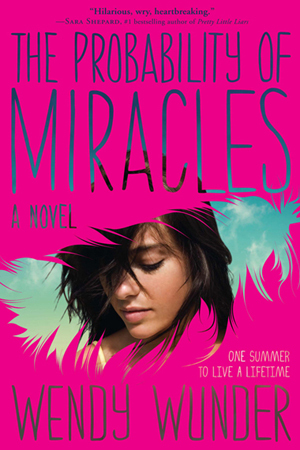 Wendy Wunder is the author of the recently released book The Possibility of Miracles. It's funny and sad and quirky, and I loved it (review coming soon!). Wendy was kind enough to answer a couple of my questions recently--check them out! TCR: I like how Cam grew up at Disney World--have you spent a lot of time at Disney? TCR: Have you ever written your own Flamingo List? WW: You know. I don’t think I have. I’m not really good at planning ahead. And for a while I wasn’t good at knowing what I wanted. But I had a lot of fun in my twenties so I feel like I checked off a lot of things. I’ve lived in New York, San Francisco and Boston. I’ve traveled through Europe a couple of times. I’ve driven across the country. I learned another language. I’ve fallen in love. Started a family and now I’ve written a book, which was probably secretly number one on the list the whole time. So now anything else that comes along is just gravy! I’m pretty lucky and very grateful. And yet, still, a little poor. So maybe I should put saving money on that Flamingo List! TCR: What was the hardest part about writing The Probability of Miracles? The easiest? WW: Hardest part: description. Easiest part: dialogue. I get swept up in the pace of the dialogue and I have trouble slowing down and describing where people are while they’re talking. It’s okay though. I just hand in a draft that looks like a script and then fill in details later. TCR: What was your reaction when you first saw the cover? WW: I Love the cover. I’m not normally a Pink kind of gal. In fact when my daughter was born I dressed her in a lot of purple to avoid being inundated in pinkness. The manager at our local grocery store still calls her “Violetta” because she was always dressed in purple. But I think the pink works. And the feather is cool. And the model on the cover is beautiful. AND the font is Perfect. I love it. TCR: What are you working on now? WW: A couple of things, but one is a teenage Thelma and Louise road story about the power of friendship and the mysteries of the universe…Stay tuned! Stay tuned for my review of this awesome book! Not convinced that you need to pick this one up? Then read a free excerpt and watch the book trailer below! Cover Talk: Melissa Walker's New Book! Emma Carlson Berne and Still Waters!